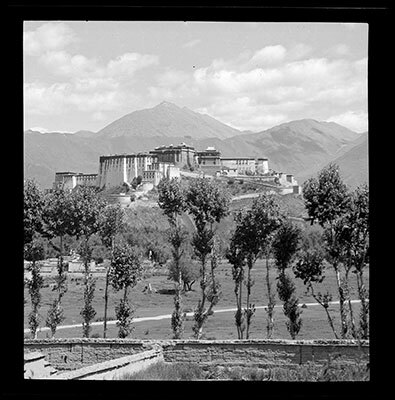 View of Potala from the north northeast. There are tall trees in the foreground and the boundary wall of the Lhalu mansion in front of them. The Tibet Album. "Potala from north northeast taken from Lhalu mansion" 05 Dec. 2006. The Pitt Rivers Museum. <http://tibet.prm.ox.ac.uk/photo_2001.59.8.6.1.html>.